A miniature version of Our Lady of the Pillar is displayed in the chapel of Islander’s brother’s house. Members of his religious community brought back the replica from Saragossa, Spain, where their founder, Father William Joseph Chaminade, was exiled during the French Revolution. There he was inspired by Mary with a mission to bring faith and hope back to France and to the world. Centuries earlier, St. James was also inspired by Our Blessed Mother to do the same and share the gospels and love of her son, Jesus Christ, with the Spaniards and the world. In an apparition to Sant Iago, as he was called in Spain, she presented him with a pillar as a promise to help him with his mission. St. James built a chapel in Saragossa in her honor. Shortly thereafter, he was martyred and his remains are believed to be enshrined at the cathedral in another Spanish town, Compostela. Santiago de Compostela is the third most frequently visited Christian pilgrimage site after Rome and Jerusalem. Several eateries in the area sell a Spanish almond cake, called Tarta de Santiago, associated with the country’s patron saint. We baked and decorated one for his feast day and also featured his cross in the center of the cake. 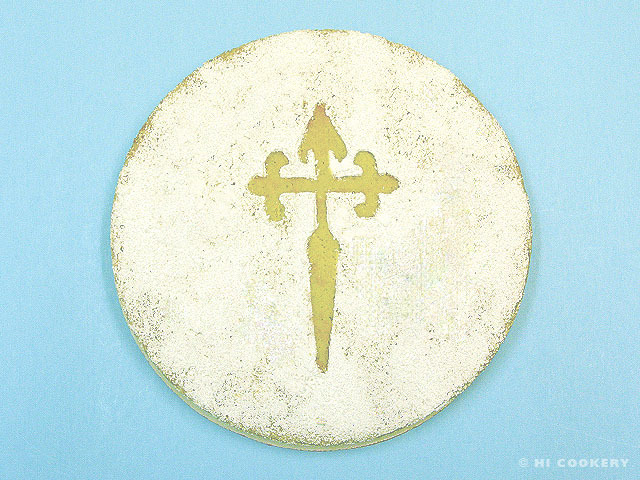 Taste the tradition and make Tarta de Santiago for the Feast Day of St. James. 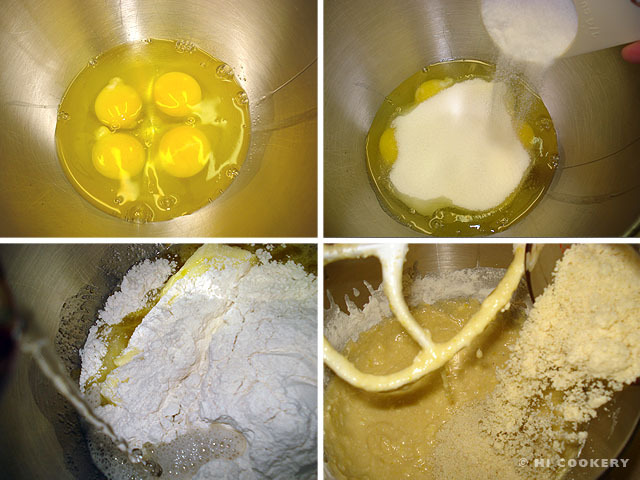 In a large mixing bowl, beat the eggs with the sugar until smooth. Add the butter, flour and water. Mix until well blended. Add the almond flour/meal. Stir in the grated lemon rind. 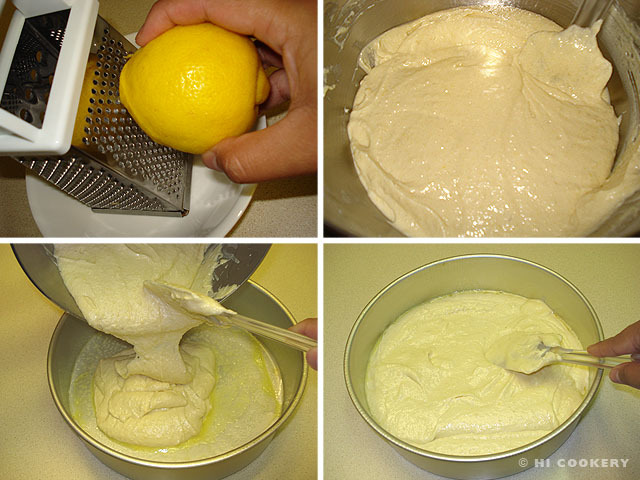 Pour the batter into a greased, 10-inch round cake pan. Spread evenly for a smooth top. Bake in a preheated oven at 350 degrees F for 30-40 minutes until golden brown, testing with a toothpick for doneness. Remove from the oven and cool completely on a wire rack over another baking pan to catch the crumbs and powdered sugar. Print and cut out a graphic of the St. James cross. Center it on top of the cake. Sprinkle powdered sugar over the top of the cake using a sieve. 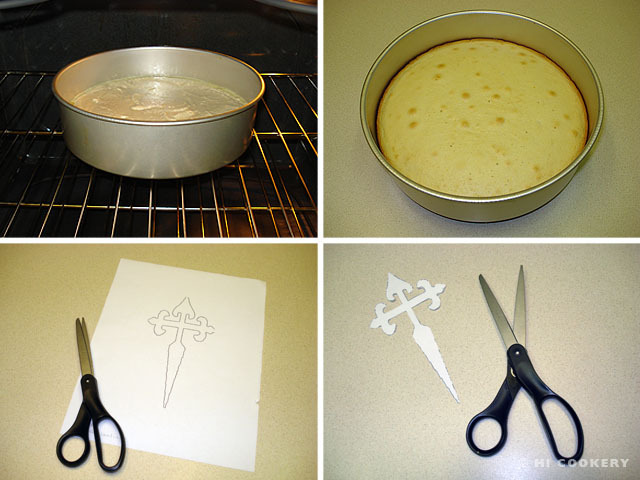 Carefully remove the paper cutout with tweezers. Brush off any stray powdered sugar or crumbs. Present the cake on a platter or board. Slice into wedges and serve. 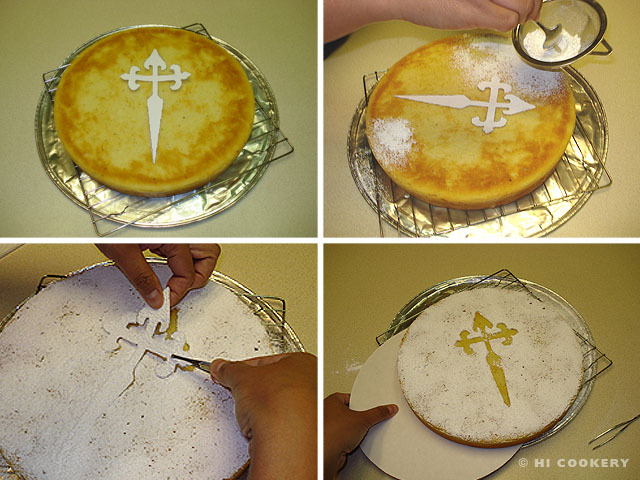 We used the St. James cross graphic from Wikipedia to decorate the almond cake. 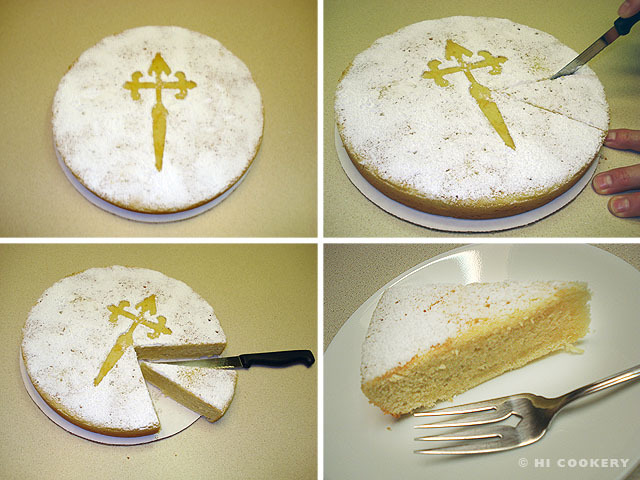 This cake is similar to Ignacio, the almond cake associated with St. Ignatius of Loyola, whose feast day is July 31. Try the Jamaican recipe for St. Iago pork chops which we also made on the Feast Day of St. James. Islander, Highlander…this is just so beautiful and serendipitous! Let me explain….just yesterday I watched the film The Way which was written and directed by Emilio Estevez and starred his dad Martin. The story is built around Santiago de Compostela and the path of St. James. It was profoundly beautiful and compelling in a way that I haven’t experienced in years regarding films (although I admit to be being partial to anything to do with hiking). When it comes out in the states, you should really try to see it, in September or October I believe.